Hamar is the largest city in the county of Hedmark. 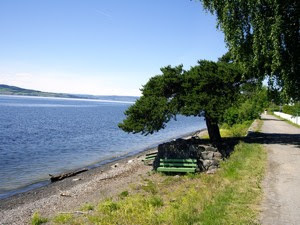 It is located by Mjøsa and is surrounded by some of the most fertile agricultural areas in the whole country. Today's city was built up early in the 19th century. But there has been a city here also in the Middle Ages. It was abandoned 400 years ago. 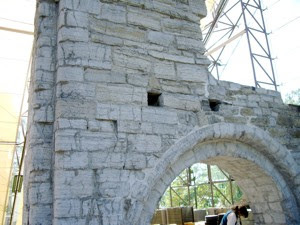 There are, however impressive architectural remains from this early period of settlement. The remains of the old cathedral and the fortress that once used to be the home of the local bishop are the most important. They are located on a small peninsula, north of the city centre, and you can get there by walking along the beach. Here you can admire the view of the large lake. As transportation on large bodies of water were among the most convenient far back, the cathedral and the fortress had an excellent strategic location. The fact that it was located in some of the most fertile and wealthiest areas of the country meant that they could build in a much bigger scale than in most other places. The old cathedral goes 850 years back in time, to 1152. This year the papal envoy Nicholas Breakspere (the later pope Hadrian IV) founded the diocese at Hamar. The farm of Åker had been a political seat of power since the late Roman era, and a seat of a Thing, an old norse political assembly. The construction of the cathedral started in the same period. 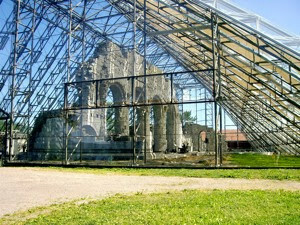 It was a basilica built in Romanesque style with its characteristic rounded arches. It had one main nave and two lower aisles divided by two large arcades. Today only one is arcade is back. It had two side ships, one central tower and two towers in the front. It may have looked like this drawing made by Øyvind Nordhagen. It was an impressive building, by far one of larges of its kind in the country and an important symbol of the power of the bishops of Hamar. Well what happened? How could an important seat of power disappear like this. 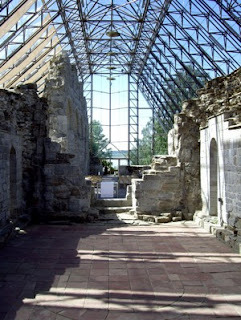 Up until the 16th century Hamar was one of the five most important cities in Norway. In the 16th century the Danish-Norwegian kingdom was at war with Sweden. At the same time an important rival to Hamar gained strength. The Norwegian capital Oslo, felt the competition from Hamar to be the most important city in the Eastern part of the country. In 1537 the last Roman Catholic bishop Mogens gave up, as the Protestant reformation established itself in the country. 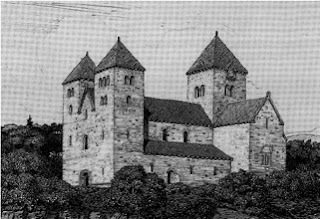 In 1567, during the northern seven years war, the army of the Swedish king Erik XIV, lead by Johan Siggeson, destroyed most of the cathedral. In 1587 the city market was closed down by the king and the city lost its privileges. That was the end of old Hamar. The ruins fell into disrepair. The ruins at Domkirkeodden (cathedral peninsula), continued to decay. Some parts of the old fortress was preserved as barns for the Storhamar farm. In 1985 the condition of what was left of the cathedral reached a critical point. It was wrapped in plastic to avoid further decay. Thanks to generous donations from an American of Norwegian descent, Mrs. Gerd Thune Ellefsen Perkins, a glass building was built over it. This great building, designed by the renowned architects Kjell Lund and Nils Slaatto will preserve the ruins for coming generations to see. The new building is spectacular. Its ground breaking design creates a new church room. 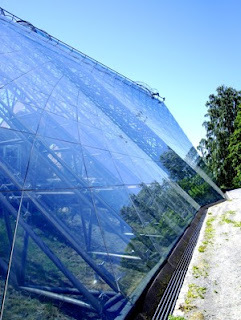 The glass filters the light through in a remarkable way and you feel that you are out in the free - inside! Today this building is a great venue for concerts, and the day we visited four weddings were in process. We were lucky to see this architectural wonder, as we sneaked in during one of the breaks. You are hereby advised to visit this beautiful spot, if you are on you way north through eastern Norway. 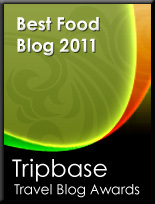 You will certainly not regret it!! 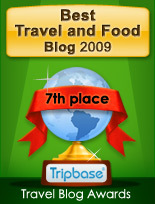 See other sights in Oslo and around the world here on Enjoy Food & Travel - your travel source!